Results, as expected, were excellent. It took the 5000DV just 115 seconds to transfer more then 1GB via USB 2.0. 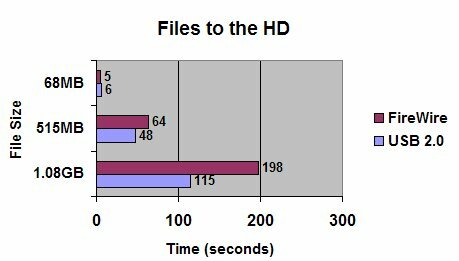 It took almost 200 seconds via FireWire for the same test, but one reason why the results are so different could be because it was done using a less-powerful computer. Still, 200 seconds is excellent for more than 1GB of data. The 5000DV needed 48 seconds to transfer 515MB of files to the hard drive. This is extremely fast. FireWire took 64 seconds on the same test. To transfer 68MB, FireWire won. It took 6 seconds to transfer via USB 2.0, and 5 seconds via FireWire. Not much of a difference, though. Files from the hard drive had good results, but were lower then when transferring to the hard drive. It took the drive 164 seconds to transfer more then a 1GB of files via USB 2.0 from the drive to a local drive. It's quick, but it is much slower then transferring to the drive. The same test took 247 seconds when using FireWire, more then a minute longer then USB 2.0. Nevertheless, as an overall, results were very good.